For the company formerly known as Qt Software, see The Qt Company. Qt (pronounced "cute") is a free and open-source widget toolkit for creating graphical user interfaces as well as cross-platform applications that run on various software and hardware platforms such as Linux, Windows, macOS, Android or embedded systems with little or no change in the underlying codebase while still being a native application with native capabilities and speed. Qt is currently being developed by The Qt Company, a publicly listed company, and the Qt Project under open-source governance, involving individual developers and organizations working to advance Qt. 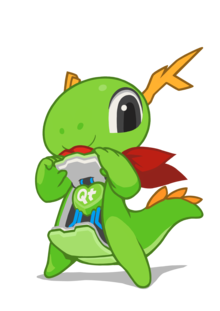 Qt is available under both commercial licenses and open source GPL 2.0, GPL 3.0, and LGPL 3.0 licenses. Qt is used for developing graphical user interfaces (GUIs) and multi-platform applications that run on all major desktop platforms and most mobile or embedded platforms. Most GUI programs created with Qt have a native-looking interface, in which case Qt is classified as a widget toolkit. Also non-GUI programs can be developed, such as command-line tools and consoles for servers. An example of such a non-GUI program using Qt is the Cutelyst web framework. Other features include SQL database access, XML parsing, JSON parsing, thread management and network support. The latest version is Qt 5.12 LTS, which was released on 6 December 2018. It comes with several new features including Technology Preview of Qt for Python and of Qt for WebAssembly. The current LTS version is Qt 5.12 LTS. It was released on 6 December 2018 and will be supported for 3 years. The initial release of Qt software was on 20 May 1995. In 2017, the Qt Company estimated a community of about 1 million developers worldwide in over 70 industries. Blackberry 10, a touchscreen-based mobile OS by Blackberry Ltd.
AMD's Radeon Software Crimson Edition driver tool application. Dolphin (emulator), an emulator for the Nintendo Wii and Nintendo GameCube systems. Mathematica, a mathematical symbolic computation program, sometimes termed a computer algebra system or program, used in many scientific, engineering, mathematical, and computing fields. There are cases where applications have ported their user interface code from another toolkit to Qt to make use of a cross-platform native GUI, such as the Wireshark network packet analyzer, LXQt desktop, VLC media player and the Rosegarden audio editor. When first released, Qt used its own paint engine and controls, emulating the look of the different platforms it runs on when it drew its widgets. This made the porting work easier because very few classes in Qt depended really on the target platform; however, this occasionally led to slight discrepancies where that emulation was imperfect. Recent versions of Qt use the native style APIs of the different platforms, on platforms that have a native widget set, to query metrics and draw most controls, and do not suffer from such issues as often. On some platforms (such as MeeGo and KDE) Qt is the native API. Some other portable graphical toolkits have made different design decisions; for example, wxWidgets uses the toolkits of the target platform for its implementations. A language construct introduced in Qt for communication between objects which makes it easy to implement the observer pattern while avoiding boilerplate code. The concept is that GUI widgets can send signals containing event information which can be received by other controls using special functions known as slots. The metaobject compiler, termed moc, is a tool that is run on the sources of a Qt program. It interprets certain macros from the C++ code as annotations, and uses them to generate added C++ code with meta information about the classes used in the program. This meta information is used by Qt to provide programming features not available natively in C++: signals and slots, introspection and asynchronous function calls. Qt Core The only required Qt module, containing classes used by other modules, including the meta-object system, concurrency and threading, containers, event system, plugins and I/O facilities. Qt GUI The central GUI module. In Qt 5 this module now depends on OpenGL, but no longer contains any widget classes. Qt Widgets Contains classes for classic widget based GUI applications and the QSceneGraph classes. Was split off from QtGui in Qt 5. Qt Quick The module for GUI application written using QML2. Qt Quick Controls Widget like controls for Qt Quick intended mainly for desktop applications. Qt Quick Layouts Layouts for arranging items in Qt Quick. Qt Network Network abstraction layer. Complete with TCP, UDP, HTTP, SSL and since Qt 5.3 SPDY support. Qt Multimedia Widgets The widgets from Qt Multimedia. Qt SQL Contains classes for database integration using SQL. Qt WebEngine A new set of Qt Widget and QML webview APIs based on Chromium. Active Qt Classes for applications which use ActiveX. Qt Bluetooth Classes accessing Bluetooth hardware. Qt D-Bus Classes for IPC using the D-Bus protocol. Qt NFC Classes accessing NFC hardware. Only officially supported on BlackBerry hardware so far (or N9 in the MeeGo port). Qt OpenGL Legacy module containing the OpenGL classes from Qt 4. In Qt 5 the similar functionality in Qt GUI is recommended. Qt Location Classes for accessing GPS and other location services and for mapping and navigation. Split off from the Qt 4 Mobility module of Qt Location. Supported on Android, BlackBerry, iOS, Linux (using GeoClue), Windows and Sailfish OS. Qt Sensors Classes for accessing various mobile hardware sensors. Used to be part of Qt Mobile in Qt 4. Supported on Android, BlackBerry, iOS, WinRT, Mer and Linux. Qt Serial Port Classes for access to hardware and virtual serial ports. Supported on Windows, Linux and macOS. Qt WebChannel Provides access to Qt objects to HTML/Js over WebSockets. Qt WebKit Qt's WebKit implementation and API. Qt WebSockets Provides a WebSocket implementation. Qt XML Legacy module containing classes for SAX and DOM style XML APIs. Replaced with QXmlStreamReader and QXmlStreamWriter classes in Qt Core. There are four editions of Qt available: Community, Indie Mobile, Professional and Enterprise. The Community version is under the open source licenses, while the Indie Mobile, Professional and Enterprise versions, which contain additional functionality and libraries, e.g. Enterprise Controls are commercially sold by The Qt Company. Wayland Qt for Wayland. Qt applications can switch between graphical backends like X and Wayland at load time with the -platform command line option. This allows a seamless transition of Qt applications from X11 to Wayland. Android Qt for Android (formerly known as Necessitas). Sailfish OS Qt for SailfishOS, which uses Wayland. Embedded Linux Qt for embedded platforms: personal digital assistant, smartphone, etc. Exists as multiple platforms depending on display technology. DirectFB, LinuxFB and EGLFS (EGL Full Screen). Windows CE Qt for Windows CE 6 and Windows Embedded Compact 7. After Nokia opened the Qt source code to the community on Gitorious various ports appeared. There are also some ports of Qt that may be available, but are not supported anymore. These platforms are listed in List of platforms supported by Qt. Qt is available under the following free software licenses: GPL 2.0, GPL 3.0, LGPL 3.0 and LGPL 2.1 (with Qt special exception). Note that some modules are only available under a GPL license, which means that applications which statically link to these modules need to comply with that license. In addition, Qt has always been available under a commercial license, like the Qt Commercial License, that allows developing proprietary applications with no restrictions on licensing. Qt comes with its own set of tools to ease cross-platform development, which can otherwise be cumbersome due to different set of development tools. Qt Creator is a cross-platform IDE for C++ and QML. Qt Designer's GUI layout/design functionality is integrated into the IDE, although Qt Designer can still be started as a standalone tool. In addition to Qt Creator, Qt provides qmake, a cross-platform build script generation tool that automates the generation of Makefiles for development projects across different platforms. There are other tools available in Qt, including the Qt Designer interface builder and the Qt Assistant help browser (which are both embedded in Qt Creator), the Qt Linguist translation tool, uic (user interface compiler), and moc (Meta-Object Compiler). In the summer of 1990, Haavard Nord and Eirik Chambe-Eng (the original developers of Qt and the CEO and President, respectively, of Trolltech) were working together on a database application for ultrasound images written in C++ and running on Mac OS, Unix, and Windows. They began development of "Qt" in 1991, three years before the company was incorporated as Quasar Technologies, then changed the name to Troll Tech and then to Trolltech. The toolkit was called Qt because the letter Q looked appealing in Haavard's Emacs typeface, and "t" was inspired by Xt, the X toolkit. The first two versions of Qt had only two flavors: Qt/X11 for Unix and Qt/Windows for Windows. On 20 May 1995 Troll Tech publicly released Qt 0.90 for X11/Linux with the source code under the Qt Free Edition License. This license was viewed as not compliant with the free software definition by Free Software Foundation because, while the source was available, it did not allow the redistribution of modified versions. Trolltech used this license until version 1.45. Controversy erupted around 1998 when it became clear that the K Desktop Environment was going to become one of the leading desktop environments for Linux. As it was based on Qt, many people in the free software movement worried that an essential piece of one of their major operating systems would be proprietary. The Windows platform was only available under a proprietary license, which meant free/open source applications written in Qt for X11 could not be ported to Windows without purchasing the proprietary edition. With the release of version 2.0 of the toolkit, the license was changed to the Q Public License (QPL), a free software license, but one regarded by the Free Software Foundation as incompatible with the GPL. Compromises were sought between KDE and Trolltech whereby Qt would not be able to fall under a more restrictive license than the QPL, even if Trolltech was bought out or went bankrupt. This led to the creation of the KDE Free Qt foundation, which guarantees that Qt would fall under a BSD-style license should no free/open source version of Qt be released during 12 months. This was resolved when Trolltech released Qt 4.0 also for Windows under the GPL in June 2005. Qt 4 supported the same set of platforms in the free software/open source editions as in the proprietary edition, so it is possible, with Qt 4.0 and later releases, to create GPL-licensed free/open source applications using Qt on all supported platforms. The GPL v3 with special exception was later added as an added licensing option. The GPL exception allows the final application to be licensed under various GPL-incompatible free software/open source licenses such as the Mozilla Public License 1.1. Nokia acquired Trolltech ASA on 17 June 2008 and changed the name first to Qt Software, then to Qt Development Frameworks. Nokia focused on turning Qt into the main development platform for its devices, including a port to the Symbian S60 platform. Version 1.0 of the Nokia Qt SDK was released on 23 June 2010. The source code was made available over Gitorious, a community oriented git source code repository, with a goal of creating a broader community using and improving Qt. On 14 January 2009, Qt version 4.5 added another option, the LGPL, to make Qt more attractive for both non-GPL open source projects and closed applications. In February 2011, Nokia announced its decision to drop Symbian technologies and base their future smartphones on the Windows Phone platform instead. One month later, Nokia announced the sale of Qt's commercial licensing and professional services to Digia, with the immediate goal of taking Qt support to Android, iOS and Windows 8 platforms, and to continue focusing on desktop and embedded development, although Nokia was to remain the main development force behind the framework at that time. In March 2011, Nokia sold the commercial licensing part of Qt to Digia creating Qt Commercial. In August 2012, Digia announced that it would acquire Qt from Nokia. The Qt team at Digia started their work in September 2012. They released Qt 5.0 within a month and newer versions every 6 months with new features and additional supported platforms. In September 2014, Digia transferred the Qt business and copyrights to their wholly owned subsidiary, The Qt Company, which owns 25 brands related to Qt. In May 2016, Digia and Qt demerged completely into two independent companies. Framework development of Qt 5 moved to open governance at qt-project.org, which made it possible for developers outside Digia to submit patches for review. Aside from The Qt Company, many organizations and individuals using Qt as their development platform participate in the open development of Qt via the Qt Project. One such Qt contributor is KDAB, a Swedish Qt consulting company. KDAB is involved in many areas, including maintenance of several components. Together with RIM/BlackBerry, KDAB is maintaining the QNX and BlackBerry 10 ports of Qt. Another participator is Intel, contributing for example Wayland support. AudioCodes maintains IBM ClearCase support in Qt Creator. As a heavy user of Qt, the KDE project submits many patches and features from its developer library KDE Frameworks back to Qt. Bocklage-Ryannel, Juergen; Thelin, Johan (12 May 2015). "Qt 5 Cadaques" (1st ed.). Blanchette, Jasmin; Summerfield, Mark (14 February 2008). "C++ GUI Programming with Qt 4" (2nd ed.). Prentice Hall. ISBN 978-0-13-235416-5. Summerfield, Mark (23 August 2010). "Advanced Qt Programming: Creating Great Software with C++ and Qt 4" (1st ed.). Addison-Wesley. ISBN 978-0-321-63590-7. Fitzek, Frank H. P.; Mikkonen, Tommi; Torp, Tony (17 May 2010). "Qt for Symbian" (1st ed.). Wiley. ISBN 0-470-75010-3. Archived from the original on 19 December 2009. Summerfield, Mark (28 October 2007). "Rapid GUI Programming with Python and Qt" (1st ed.). Prentice Hall. ISBN 978-0-13-235418-9. Molkentin, Daniel (19 July 2007). "The Book of Qt 4: The Art of Building Qt Applications" (1st ed.). No Starch Press. ISBN 978-1-59327-147-3. Thelin, Johan (3 August 2007). "Foundations of Qt Development" (1st ed.). Apress. ISBN 978-1-59059-831-3. Dalheimer, Matthias (January 2002). "Programming with Qt" (2nd ed.). O'Reilly Media. ISBN 978-0-596-00064-6. Ezust, Alan; Ezust, Paul (10 September 2006). "An Introduction to Design Patterns in C++ with Qt 4" (2nd ed.). Prentice Hall. ISBN 978-0-13-187905-8. ^ a b c d e Blanchette, Jasmin; Summerfield, Mark (June 2006). "A Brief History of Qt". C++ GUI Programming with Qt 4 (1st ed.). Prentice-Hall. pp. xv–xvii. Retrieved 5 August 2013. ^ Turunen, Tuukka (1 February 2019). "Qt 5.12.1 Released". Qt Blog. The Qt Company. Retrieved 1 February 2019. ^ a b c "Licenses". ^ a b c "New agreement with the KDE Free Qt Foundation and changes for the open source version". The Qt Company. ^ a b "Adding LGPL v3 to Qt". 20 August 2014. ^ "Qt - About Us". Archived from the original on 22 February 2017. ^ "That Smartphone Is So Qt". Ashlee Vance. 16 February 2010. Retrieved 19 February 2010. ^ "The Qt 4 Dance" (video). Retrieved 7 September 2015. ^ Pintscher, Lydia (21 October 2011). "KDE Applauds Qt's Move to Open Governance". KDE.News. Retrieved 8 May 2013. ^ Meyer, David (24 October 2011). "Nokia gives Qt open-source governance". ZDNet. Retrieved 8 May 2013. ^ Knoll, Lars (6 August 2014). "Defragmenting Qt and Uniting Our Ecosystem". ^ Heikkinen, Jani (6 December 2018). "Qt 5.12 Release". The Qt Company. Retrieved 21 February 2019. ^ Leppälä, Kimmo (7 June 2017). "Renewed Qt Support Services". Qt Project. Retrieved 8 June 2017. ^ "QT GROUP OYJ - Managers' Transactions, 12/4/2017". 12 April 2017. Retrieved 8 June 2017. ^ Shneor, Rotem (2012). "Handbook of Research on Born Globals, Chapter 10: Born Global Firms, Internet, and New Forms of Internationalization". Retrieved 8 June 2017. ^ "The KDE development platform". ^ Marius Nestor (24 December 2015). "Beautifully Crafted Deepin 15 Linux OS Drops Ubuntu for Debian Sid, RC Out Now". The Deepin desktop environment has been refactored in the latest Qt GUI toolkit, replacing the HTML5 and WebKit frameworks, while Go is still used for the backend. ^ "深度操作系统 15 RC ——用真心捕获你的芳心 – 深度科技社区". Deepin.org. 23 December 2015. Retrieved 15 June 2017. ^ "Unity8 – A convergent desktop environment". Unity8.io. Retrieved 7 January 2019. ^ "Unity8 Code Repository on Github". Github.com. ^ "LiriOS Shell on Github". ^ "X Series Qt-based graphical user interface". ^ "Avionics powered by Qt". ^ "Next interface for Nemo mobile". ^ "Sky teams up with The QT Company on Sky Q". ^ "Ultrahaptics - A remarkable connection with technology". Ultrahaptics. Retrieved 15 June 2017. ^ "C++ GUI Programming with Qt4 By Jasmin Blanchette, Mark Summerfield". ^ "Mobile Computing, Applications, and Services: First International ICST Conference, MobiCASE 2009, San Diego, CA, USA, October 26-29, 2009, Revised Selected Papers, Edited by Petros Zerfos, Rebecca Montanari, Thomas Phan". ^ Walton, Mark (2 November 2015). "AMD Radeon Software Crimson: A new name and a new look for Catalyst". ^ "Qt in Autodesk". Archived from the original on 23 July 2011. ^ "Dyami Caliri, Qt Champion 2014". ^ "Google Earth Includes a Web Browser". Googlesystem.Blogspot.de. 15 June 2010. Retrieved 8 April 2013. ^ "Krita 3.0 Released". 31 May 2016. Retrieved 5 September 2017. ^ "Orange3 Data Mining Suite". ^ "Sibelius - the leading music composition and notation software". www.sibelius.com. Retrieved 19 October 2016. ^ "Panorama - Valve Developer Community". Retrieved 28 April 2017. ^ "Subsurface 4.0 has been released". 15 December 2013. ^ "Telegram desktop messaging app". ^ "VBoxMainLogging - Oracle VM VirtualBox". ^ wps-community (14 June 2017). "wps_i18n: KSO/WPS internationalization support". Retrieved 15 June 2017 – via GitHub. ^ "AMD's Radeon Software Crimson Edition". Retrieved 30 June 2016. ^ "Blizzard's additions/modifications to Qt". ^ "Open Source - Electronic Arts". ^ "Qt in the European Space Agency". Archived from the original on 23 July 2011. ^ Behind the Scenes at DreamWorks Animation: Making the Apps that Make the Movies. ^ "Lucasfilm Entertainment Company Ltd". ^ "Qt in Visual Effects". Archived from the original on 23 July 2011. ^ "Qt World Summit talk". ^ "Panasonic selects Qt for HD video system". Archived from the original on 23 July 2011. ^ "Qt in IP Communications". Archived from the original on 23 July 2011. ^ "Bosch DruckMessWT built with Qt". January 2019. ^ "Qt in Home Media". Archived from the original on 23 July 2011. ^ "Qt helped Siemens deliver a C++ development platform for manufacturing software GUIs". Archived from the original on 14 July 2011. ^ "Volvo Mobility Systems". Archived from the original on 14 July 2011. ^ "10 Qt use cases you didn't know". Archived from the original on 30 July 2013. ^ "Developing Innovative Desktop and Embedded HP Products with Qt". Archived from the original on 6 May 2014. ^ "Qt helped Walt Disney reduce development time spent on its cross-platform feature film production application". Archived from the original on 14 July 2011. ^ "Qt - Valve Developer Community". Retrieved 28 April 2017. ^ "Library". Digia. Archived from the original on 1 November 2013. Qt uses the native graphics APIs of each platform it supports, taking full advantage of system resources and ensuring that applications have native look and feel. ^ "Signals & Slots - QtCore 5.1". Qt Project. 4 July 2013. Retrieved 10 April 2015. ^ "Trolltech Releases Qt 4.0". KDE. 28 June 2005. Retrieved 5 August 2013. ^ "All Modules | Documentation". Qt Project. Retrieved 8 April 2013. ^ Qt Blog (19 December 2012). "Introducing Qt 5.0 | Qt Blog". Digia. Retrieved 8 April 2013. ^ Kyle Morris (24 December 2012). "Qt 5.0 - Congratulations to the Qt Project". KDE. Retrieved 5 August 2013. ^ "QtDoc 5.1: All Modules". Qt Project. Retrieved 8 April 2013. ^ a b "Qt Download page". Download Qt. The Qt Company. Retrieved 21 November 2014. ^ "Qt Wiki – Support for Linux/X11". Qt Project. 12 August 2011. Retrieved 21 August 2013. ^ Lind, Jørgen (18 March 2011). "Multi-process Lighthouse". Qt Project. Retrieved 21 August 2013. ^ "Getting started with Lighthouse". Retrieved 25 November 2011. ^ Høgsberg, Kristian (25 January 2011). "Add wayland lighthouse plugin". Archived from the original on 3 February 2016. ^ "New Features in Qt 5.1 - Support for New Platforms". Digia. 3 July 2013. Retrieved 10 April 2015. ^ "Necessitas project". Retrieved 10 April 2015. ^ "Qt Wiki – Support for Embedded Linux". Qt Project. 12 August 2011. Retrieved 10 April 2015. ^ "Qt Wiki – Support for Windows". Qt Project. 11 August 2011. Retrieved 11 August 2013. ^ "Windows 10 Support in Qt". The Qt Company. 29 April 2015. Retrieved 28 January 2016. ^ "Qt for WinRT". Qt Project. Retrieved 9 September 2014. ^ "New Features in Qt 5.4". ^ Breitmeyer, Bjoern (21 August 2013). "The State of WinCE Support in Qt5". KDAB. Retrieved 21 August 2013. ^ "Qt Wiki – Support for OS X". Qt Project. 14 August 2011. Retrieved 21 August 2013. ^ "Supported Platforms". Retrieved 1 February 2014. ^ "Qt Product pages, Supported platforms". Qt - Product - Qt Framework. The Qt Company. Retrieved 21 November 2014. ^ Katherine Barrios (29 November 2011). "Qt Commercial Formally Supports QNX | Qt Blog". Retrieved 13 March 2018. ^ "Platform and Compiler Notes - QNX | Qt 5.10". ^ Tuukka Turunen (28 June 2012). "Qt Commercial for VxWorks | Qt Blog". Retrieved 13 March 2018. ^ "Qt for VxWorks | Qt 5.10". ^ "Digia Qt LGPL Exception version 1.1". ^ "Qt Licensing". The Qt Company. Retrieved 7 January 2017. ^ "Obligations of the LGPL". The Qt Company. Retrieved 7 January 2017. In case of static linking of the library, the application itself may no longer be “work that uses the library” and thus become subject to LGPL. It is recommended to either link dynamically, or provide the application source code to the user under LGPL. ^ "Qt - Qt20". Qt. ^ "Qt Free Edition License". Trolltech. 1992. Archived from the original on 14 October 2016. Retrieved 14 October 2016. ^ "Happy 20th Anniversary Qt!". Qt Blog. ^ "Qt framework celebrates its 20th anniversary". SD Times. ^ "KDE Free Qt Foundation". ^ "KDE Free Qt Foundation announcement". June 1998. ^ "Software License Agreement" (PDF). Digia. 13 April 2013. ^ "Trolltech offers a choice in licensing with the addition of GPL licensing for the upcoming release of Qt". Qt.nokia.com. Archived from the original on 13 March 2012. Retrieved 13 November 2011. ^ "Q../Windows Edition history". 5 June 2006. Archived from the original on 31 July 2010. ^ "Qt Non-commercial FAQ". Trolltech. Archived from the original on 5 October 2003. ^ "Trolltech Releases Qt 4.0 | KDE.news". KDE.News. Retrieved 13 November 2011. ^ "Nokia Corporation Qt GPL Exception Version 1.3". Doc.trolltech.com. 22 July 1999. Retrieved 13 November 2011. ^ Weber, Niels (23 June 2010). "Nokia Qt SDK 1.0 released". Labs.trolltech.com. Retrieved 13 November 2011. ^ Nyström, Sebastian (14 January 2009). "Nokia to license Qt under LGPL". Retrieved 17 September 2013. ^ "ICS Whitepaper on the Implications of Qt under LGPL for Commercial and Government users" (PDF). Retrieved 13 November 2011. ^ "Nokia and Microsoft Announce Plans for a Broad Strategic Partnership to Build a New Global Mobile Ecosystem" (Press release). Microsoft. 10 February 2011. Archived from the original on 1 April 2011. Retrieved 27 October 2011. ^ Nystrom, Sebastian (7 March 2011). "Nokia and Digia working together to grow the Qt community". Retrieved 8 July 2011. ^ Digia Plc (9 August 2012). "Digia to acquire Qt from Nokia". Digia Plc. Retrieved 17 October 2014. ^ Digia Plc (18 September 2012). "The journey starts today". Digia Plc. Retrieved 17 October 2014. ^ "TMview search result shown on September 12th, 2016". TMDN.org. Retrieved 15 June 2017. ^ "Digia and Qt have demerged into two companies – Digia's new strategy's main themes revealed". Digia. Retrieved 15 June 2017. ^ "Concern about removal of QWidget classes". Qt5-feedback (Mailing list). 7 October 2011. ^ Knoll, Lars (9 May 2011). "Thoughts about Qt 5". Digia. Retrieved 9 May 2011. ^ Knoll, Lars (21 October 2011). "The Qt Project is live!". Nokia. Retrieved 8 February 2012. ^ a b Macieira, Thiago. "Qt Project Statistics". Thiago Macieira's blog. Macieira.org. Retrieved 8 May 2013. ^ "contributions to Qt 5.0 (part 1)". KDAB. 20 December 2012. Retrieved 8 May 2013. ^ "contributions to Qt 5.0 (part 2)". KDAB. 21 December 2012. Retrieved 8 May 2013. ^ "Maintaining Qt3D". KDAB. 21 December 2012. Retrieved 8 May 2013. ^ "Qt5 on the QNX operating system". KDAB. 19 April 2012. Retrieved 8 May 2013. ^ "[Phoronix] Qt Is Now Drawing On Wayland". Phoronix.com. 21 September 2010. Retrieved 8 May 2013. ^ "Maintainers | Qt Wiki". Qt Project. 12 April 2013. Retrieved 8 May 2013. ^ "Frameworks/Epics/Contributions to Qt5". KDE Community Wiki. Retrieved 27 April 2015. ^ "Books - Qt Wiki". wiki.Qt.io. Retrieved 15 June 2017. Wikimedia Commons has media related to Qt.